The current system of scholarly publishing and the resultant inability of some researchers to legally and affordably access knowledge resources is resulting in the emergence of networks of piracy and other violations of copyright law. The Library does not support or condone such activities. As a valid alternative to the current system of scholarly publishing, the Library strongly supports the Open Access movement and other New Publishing Models to drive legal transformations in scholarly publishing. The Library further advocates that the UConn community comply with copyright law, including appropriate use of Fair Use provisions. The UConn community can avoid piracy and copyright violation by never sharing usernames and passwords, network logins, or barcodes. Avoid the use of pirate websites such as LibGen or Sci-Hub, which offer seemingly free access to the scholarly literature. These two websites in particular have been found to steal login credentials from unsuspecting users, which are then used to pirate vast quantities of scholarly articles. Use caution when posting scholarly articles, in particular the final published pdf file, on popular social media sites such as Academia.edu. These sites are routinely subjected to take-down notices for materials that publishers indicate are in violation of copyright. The Library provides access to vast collections of knowledge resources for the UConn community. Materials that are not accessible through the Library’s collections can generally be obtained through Document Delivery & Interlibrary Loan. The library’s new group study room reservation system, D!BS, has been in place for about a year and has been getting rave reviews from UConn students. 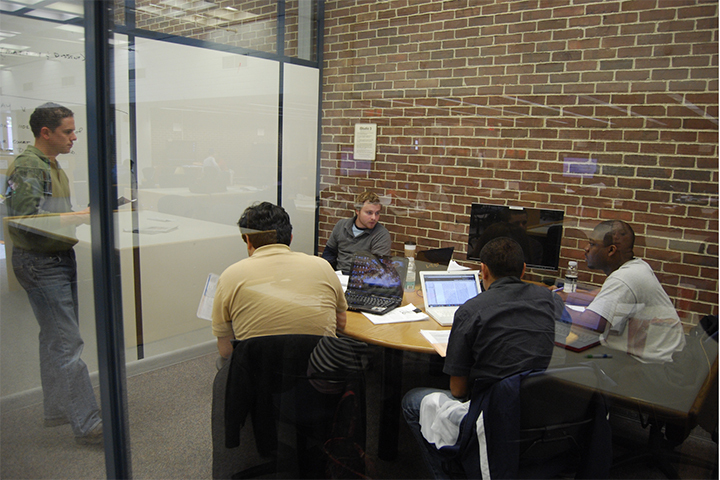 The online service allows students to log on and reserve one of 32 group study rooms at the library up to three days an advance, saving them the trouble of struggling to find a location for group work. “Being able to reserve rooms two days in advance is awesome. The days I know I have a lot of work to crank out I usually D!BS a room two days early and get a great spot for me and my friends,” said senior Teresa Forenza. Carl Strum, a UConn senior in the business school, uses the service frequently and has found that other students are adapting well to the new system. “It works, and if you have to ask someone to leave a room [because you have a reservation] 99% of the time they understand. If not, I just show them my confirmation from D!BS. If I overstay my reservation and someone else asks me to leave, I do it too,” he said. To reserve a room for a group of two or more students, just log onto the D!BS site using your NetID and password. Select the number of people in your group, how many hours you want a room (1 to 3 hours) and when you want it (reservations taken up to 3 days in advance). Hit ‘Search’ and a list of available rooms will appear- just pick one, enter some information, and you’ve got D!BS! Level B at the Homer Babbidge library is now home to the Babbidge Library Substation of the UConn Police Department, a new office to help connect students to their campus police officers. 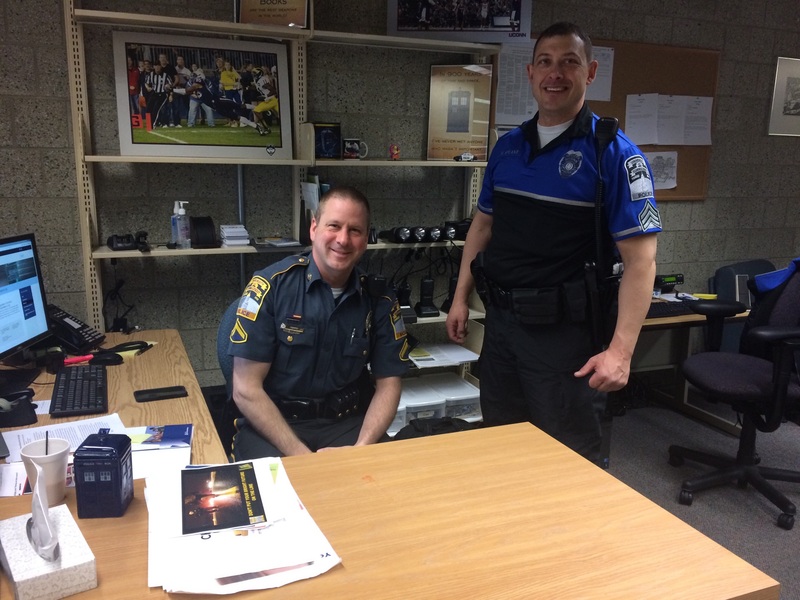 “We wanted to give the community more access by being in a centrally located area with a high presence of students,” said Officer Eric Bard, who works with the Community Outreach Unit of the police department. The substation is located on Level B of the library, next to the Laura & Walter Broughton Leisure Reading Room and has been open for about a month. The goals of the new office are centered on one main theme: communication. The officers are hoping that the new library substation will encourage students to come in, whether it’s to ask them “what if?” questions, inquire about an issue they’re not sure about – basically any police-related issue. Sometimes, students need to ask about a crime in a dorm or other area and have questions that can more easily be answered by the police than by someone like their hall director, said Sergeant Jason Hyland. Beyond police-related matters, the officers really want the community to “sit down and get to know [them] as people,” said Hyland. “If the door is open, come on in,” added Bard. Both Bard and Hyland encouraged students to stop by and talk, even if it was just to say hello and have a simple conversation. The officers are working to establish set office hours for student visits, but you can usually find them in the library from eight to noon or contact them to set up an appointment. Right now, they are trying to balance management of the new substation with their other Community Outreach efforts, which include conducting safety presentations for various student organizations and participating in campus activities such as the health and wellness fair Fresh Check Day (This year, they will be running a DUI simulator. Stop by Fairfield Way April 23 from 1-4 p.m. to check it out!). The office is also home to many brochures and information- ranging from the latest bus schedules to resources for sexual assault victims. Students may enter and take any materials they need, no questions asked (although Bard and Hyland are happy to offer any help they can). If your student organization is interested in a presentation by the UConn Police Community Outreach Unit, email pdstartteam@uconn.edu. They are also open to any new suggestions of interesting and unique ways for students and the police department to interact.